InVogueJewelry: Synthetic Opals v. Opal Simulants Shaped Like Hamsa Hands, Dolphins, Etc. Synthetic Opals v. Opal Simulants Shaped Like Hamsa Hands, Dolphins, Etc. I get all sorts of "suggestions" from Etsy, and some are great and some aren't so great. Earlier this week, one suggestion was a Hamsa hand necklace that was described as a "synthetic opal". I clicked on it because I surely have never seen any opal that was purple with all sorts of evenly disbursed speckles (like the one on the left above). It was obviously not an opal. The seller went into great detail about how this was an "actual opal" that was lab-created. So I did some research (online and in person with a gemologist) and.... sorry--buyer beware, because that's not what this is. For most people, and for most things, the word 'synethtic' means basically "fake"or made with chemicals. I think of things like synthetic grass, synthetic hair, synthetic fabrics. It means that it's not natural, but is made to look like something else. Synthetic hair looks a lot like real hair, for example, but it's not made out of hair--probably nylon fibers or something. Same with synthetic grass, like Astroturf. It LOOKS like grass, but it is made out of some sort of plastic. So for most things, synthetic means "imitation". What Does "Synthetic" Mean in Jewelry? So this is confusing, because in the jewelry industry, "synthetic" doesn't mean the same thing as everywhere else. Synthetic gemstones are man-made, in a laboratory, but they have the same EXACT chemical make-up as its natural counterpart. For example, a synthetic ruby is absolutely a genuine ruby (corundum) with the same chemical, as well as physical and optical properties, as a natural ruby---except it's grown in a lab. Even diamonds are lab-grown. These are synthetic, ACTUAL diamonds, made of carbon, but are not natural--yet they are in fact diamonds, only lab created. I like to compare synthetic gemstones to ice: you can make ice in your freezer with water, or you can find natural ice in a glacier. They're both ice (frozen water, H2O), only one is man-made and the other develops naturally. What Does "Simulated" Mean in Jewelry? Simulated jewelry means just what you think---that something is an imitation of something else. There are lots of simulated gemstones. For example, Cubic Zirconia (CZ), Swarovski crystals, Moissanite, and even glass are all diamond simulants. These are stones that are faceted and LOOK like a diamond, but when examined, do not have the same chemical properties as a genuine diamond. Glass can be colored, as can CZs, to look like rubies or emeralds or other precious or semi-precious gemstones. Even other gems can be used as a simulant---for example white topaz looks like a diamond. 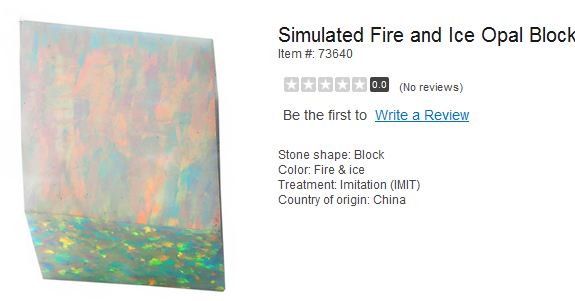 So, a simulated gemstone is an imitation. A synthetic gemstone is a man-made actual gemstone. 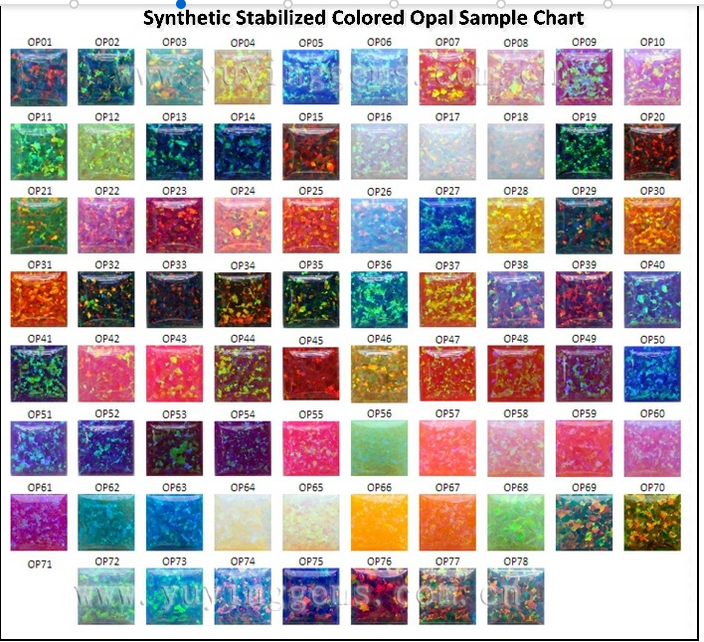 What is a Synthetic Opal v. Simulated Opal? While there are some synthetic opals available (which are lab-created opals, with the identical chemical as well as physical and optical properties of natural opal), the vast number of so-called synthetics are actually just simulated or imitation opals. They look like an opal, but they do not have any water in them, and in fact are often mostly resin (plastic). What about the Japanese "Kyocera" Synthetic Opals? These were tested by the GIA and were found to contain resin and no water. 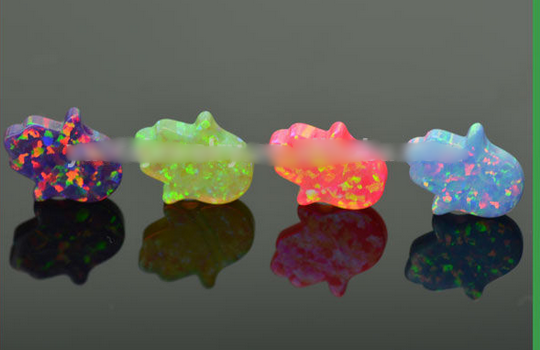 Therefore, these are simulated (imitation) opals, NOT true synthetic opals. What is "Opal Block" or "Block Opal"? I looked at the imitation opal blocks in various colors at Rio Grande, and it's amazing how beautiful and "real" this material looks! Especially the "fire and ice" (like white opal). The colors really flash and glow in the light and is pretty convincing! What About All Those "Synthetic Opal" Hamsa Charms and Round Beads? They are obviously NOT true synthetic opals, but are simulated opals. 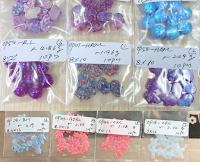 These can be purchased wholesale from alibaba and Ebay and Etsy and are generally misrepresented as synthetic opal. They seem to cost about $2-$5 each for a Hamsa, and about 20 cents for a round bead, and much less depending on volume ordered. If you look at some of the wholesalers from China, even though they are calling this "Synthetic" opal, as you scroll down the page, they explain that it is resin-filled or "stabilized". That is all you need to know that this is NOT an opal, but is an imitation opal. An opal cannot be both "synthetic" and stabilized! If it's stabilized (or plastic-filled), it's not an a actual opal. 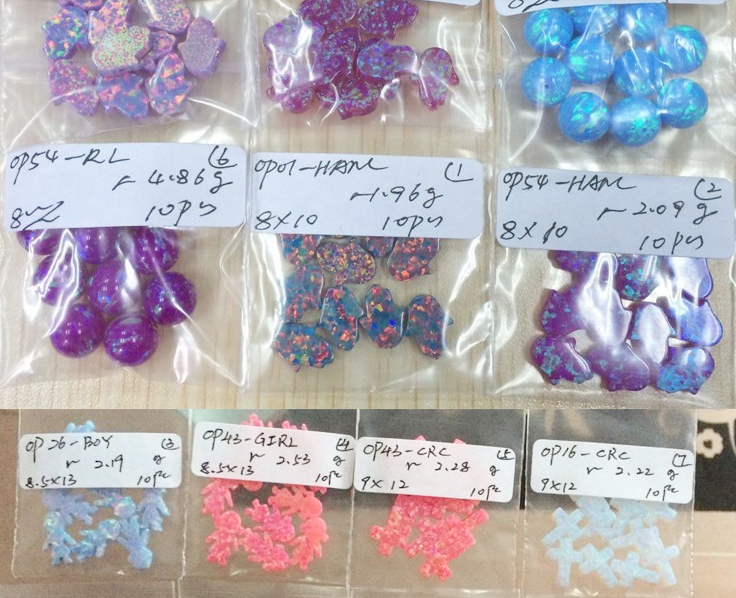 Synthetic opal (GIA: Polymer Impregnated synthetic opal) is impregnated in laboratory in around a year and has similar properties as that of natural opal. Our synthetic opal is a beautiful opal with perfect color dynamicity - revealed the beauty of Precious Opal. So although this particular wholesaler is describing this product as polymer filled with "similar properties as that of natural opal", they are still very misleading by calling it "synthetic opal". Plus there is no such thing as a "polymer impregnated synthetic" anything! The GIA never stated that! You can see their site HERE. Another wholesale company in China is selling these SAME Hamsa charms, only describing them as "Ethiopian Opal" Hamsa Hands!! That is very bad. These simulated or imitation opal beads and charms, in all their colors and shapes, are very pretty. They are also very inexpensive. They are fun to wear and would make lovely gifts. Just know that these are NOT genuine opals, whether lab-grown or natural, but are mostly plastic or resin imitation opals (lookalikes) that are molded or carved into shapes. These are pretty, but at a wholesale cost of under $2 to $5 (including a chain! ), are not genuine precious opals or fine jewelry by any means. That said, I think these are extremely pretty (some colors more than others), and I'm considering buying one in the white "fire and ice opal" look to wear myself! Just know that it isn't really a gem Opal, and that it's a simulated opal. As long as you know what you're buying, enjoy your jewelry!! It's pretty and FUN and that's what jewelry is all about. I found your blog when I was doing a search on Moonstones. I have had a love affair with jewelry since I was a teen and a passionate affair with oddities, Antiques and Rocks and minerals forever. I was incredibly impressed by your articles. They are well researched which, Let's face it, in the Jewelry world can be a problem. Very articulate and easy to understand for beginner jewelry addicts! Very good work. Also you are insanely sweet for answering all those questions. Kudos! Thank you for your kind words! I really appreciate it!